Old Testament - Lamentations Chapter 3 today starts out quite sad and empty in verses 1-20. Of course, the reason for this sadness and emptiness in these opening verses is God's discipline toward the people of Jerusalem at this time. They had sinned greatly and thus this discipline had come upon them. I think the thing for us to remember in seasons like this in our lives is that it is typically only a season. This too shall pass - if we repent & learn & grow and return to the Lord. Indeed, we see the transition in chapter 21: "Yet I still dare to hope when I remember this..." I love this! "I still dare to hope" - even in the midst of so much sadness & emptiness. In the midst of our tough seasons in life, can we still dare to hope? Why should we still dare to hope? Will you still dare to hope? Verses 22 to 66 in today's readings are just phenomenal. I could write on and on about probably each of these verses. There is so much here for us. I'd encourage you to read these verses at least twice and meditate on them and how they might apply to your life today. I'll jump through a couple of verses here that stood out to me. Verse 23 - "Great is his faithfulness; his mercies begin afresh each day." 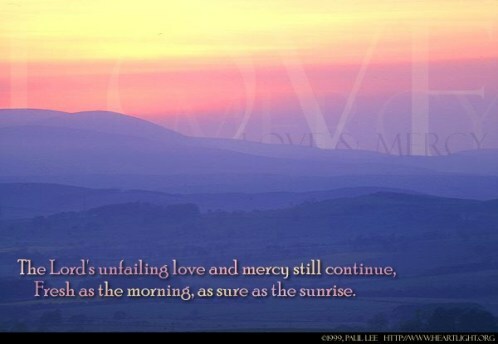 Do you experience God's mercies afresh each day? Do you believe that you can? 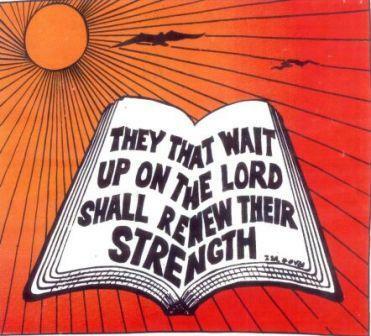 Verse 25 - "The LORD is wonderfully good to those who wait for him and seek him." If you are not experiencing God now, will you wait for him? Will you seek him? (this reminds me of Jeremy Camp's tune on his worship album - "I'll wait for the Lord. My soul waits". Great tune and great reminder that we sometimes need to wait on the Lord). New Testament - Today we begin the book of Hebrews! What a wonderful book. I read somewhere that this book is a "letter of encouragement." I do pray this book will encourage you. There is so much in this one! The author of the book of Hebrews is unknown. For many centuries, it was thought to be Paul. However, around the time of the Reformation it was thought that this letter was not from Paul, because the writing style is so different from his other letters - and because in all of his other letters, he identifies himself as the writer of the letter. Some now think that either Barnabas or Apollos were two of the potential writers of this letter. It was likely written before the destruction of the temple in Jerusalem in A.D. 70, because the temple is referred to as if it still exists in this letter. What I love about Hebrews is the multitudes of references back to Old Testament scriptures. As you read through Hebrews, I would encourage you to take note of how many OT scriptures this book is referring back to. 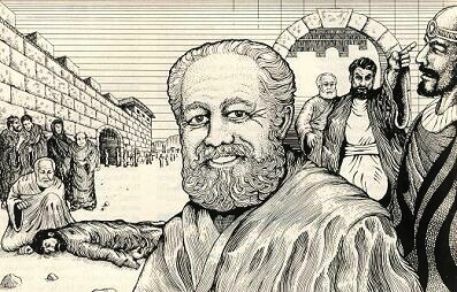 Below is an image of Barnabas' life - a potential candidate for authorship of Hebrews. You'll see Barnabas caring for Paul on the left after Paul was stoned and you'll see Barnabas on the right assisting Paul in his ministry. Content: This important letter was written to Jewish Christians who were perhaps thinking of returning to their old ways in Judaism. It was designed to show that now because Christ has come, there remains nothing in Judaism for the believer. The time of fulfillment has arrived and it would be futile to return to the old life which was inherently inferior to the new life found in the Gospel. This is justified by showing that in every way Christ is better – he is superior to angels, to Moses, and to the Old Testament priest. He mediates a better covenant and offers a better sacrifice. The life of faith that the Christian lives is also better than the old life, proof of this coming from the lives of Old Testament saints who showed the way by their lives of faith. Theme: The overall superiority of Christ and the Christian life is the central theme of this book. Other religious systems have value, no doubt, but they cannot compare with the work that God has done in Christ. Not even Judaism, which has the Old Testament, can compare, great as it was. Christ is the very essence of God, who did God’s work on earth by dying for our sins. What God requires of us now is trust in him. If we have faith then we have entered into the promises of God – fullness of life now and eternal life to come. (Above commentary is from Tyndale Publishers “The One Year Bible Companion” p. 31) A great overview of the book of Hebrews by Daniel Wallace is at this link. 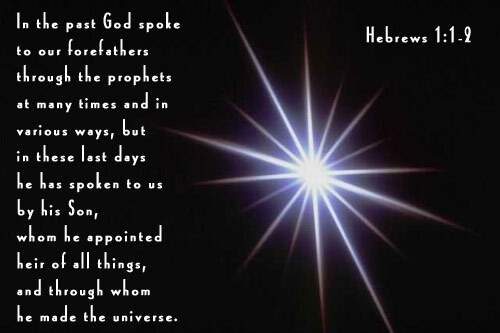 In Hebrews chapter 1, the first 3 verses set the stage incredibly well for this book - "Long ago God spoke many times and in many ways to our ancestors through the prophets. But now in these final days, he has spoken to us through his Son. 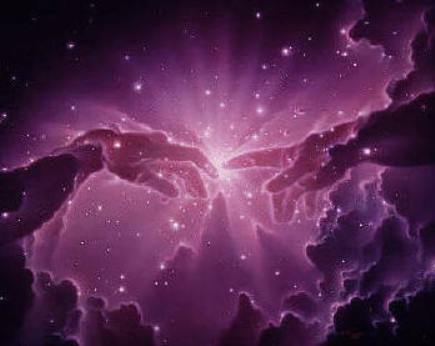 God promised everything to the Son as an inheritance, and through the Son he made the universe and everything in it. 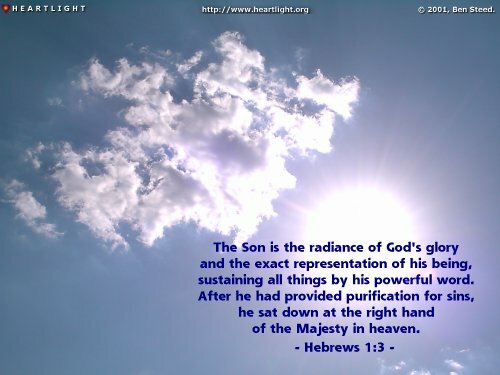 The Son reflects God's own glory, and everything about him represents God exactly. He sustains the universe by the mighty power of his command. After he died to cleanse us from the stain of sin, he sat down in the place of honor at the right hand of the majestic God of heaven." Wow... great stuff. We have indeed been reading recently about God speaking through Jeremiah in our One Year Bible readings. And here we are reminded that God is now speaking to us through Jesus. How do these 3 verses above speak to your heart? Has Jesus cleansed you from the stain of sin? 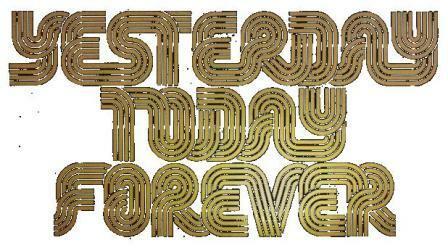 Even they will perish, but you remain forever. You will roll them up like an old coat. They will fade away like old clothing. you will never grow old." Proverbs - Proverbs 26:22 is another great reminder that rumors can invade our hearts - "What dainty morsels rumors are--but they sink deep into one's heart." We must always remember Proverbs 4:23 - "guard your heart, for it is the wellspring of life." Don't let rumors get in there! Worship God: Lamentations 3:23 obviously reminded me of the wonderful worship song "Great is Thy Faithfulness." I couldn't quite find a good version of this on song on YouTube. However, I found a wonderful song called "Great is Your Mercy" with Donnie McClurkin and several other singers. This video is actually 10 minutes and 30 seconds long! But trust me, it is worth the time! Enjoy! Can you sing "Great is Your Mercy" to God? Click here to sing! I am so excited to start the book of Hebrews. The first chapter was so encouraging to my heart already that I actually had to stop myself from reading on to the next chapter because I want to savor it. I think Hebrews 1:9 is highly inspiring to me to live a holy life (which at times seems to me to be an impossibility) but of Jesus it says that He doesn't 'just do' righteousness and justice but Jesus LOVES JUSTICE AND HE HATES EVIL. And it's because of his proper motivation that 'therefore, O God, your God has anointed you, pouring out the oil of joy on you more than on anyone else." I want to get to that place where I will love to pursue righteous and justice, and that I will hate evil as the 'natural default' of my life as opposed to having to be righteous because that's my duty and that's required, yada yada. I guess these verses show that God blesses those who pursue Him for all the right motives. As I read today’s passage I had a visual image of Jerusalem crying out the words written by Jeremiah She is the one who has seen it all, the rise of David and the built up city and fortifications of Solomon. It was within her walls that the gold laden Temple was constructed and slowly dismantled as each successive king failed to protect her by not fully walking uprightly before God or else going head long into sin. Jerusalem, the City of Zion, was picked out by God to be the city He dwelt in and built by man to try to reflect His glory, then abandoned by each successive generation. Yet despite our failure to be faithful to God, God remains faithful to His people. 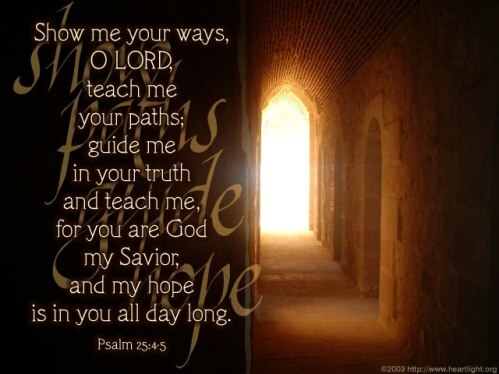 “Therefore I hope in Him!” The LORD is good to those who wait for Him, To the soul who seeks Him." I love Hebrews! Excited to read through it! Hebrews 1 is such a great chapter on the supremacy of Jesus Christ, our Lord..above the angels, equal to God the Father, yet a separate Person, He is God the Son. I love the readings! Hebrews is a theologian's playground. There is hardly another New Testament book that ties Old Testament theology and doctrine so clearly to the New Covenant.